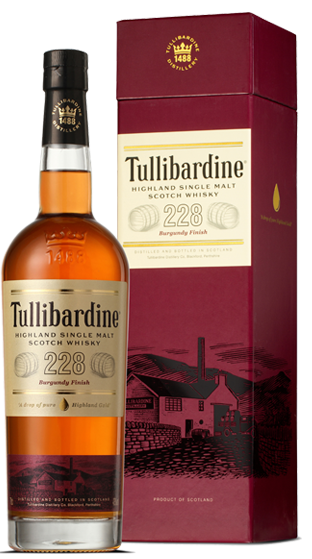 Tasting Note: Tullibardine 228 Burgundy is finished in red Burgundy casks from Chateau de Chassagne Montrachet, the home of Maison Michel Picard, which owns Tullibardine distillery. The nose features charred oak, vanilla, milk chocolate, Turkish delight and mild, sweet chilli. Sweet and spicy with a nutty palate, with eating apples, cranberries and a silky smooth texture. Allspice and damson plum round up a lengthy finish.